Baum Squad: The Baum Family Blog: Happy Birthday, sweet girl! I probably should have posted this yesterday on her actual birthday, but I was slightly busy birthing a tiny human. Eek! I still can't believe she's here. 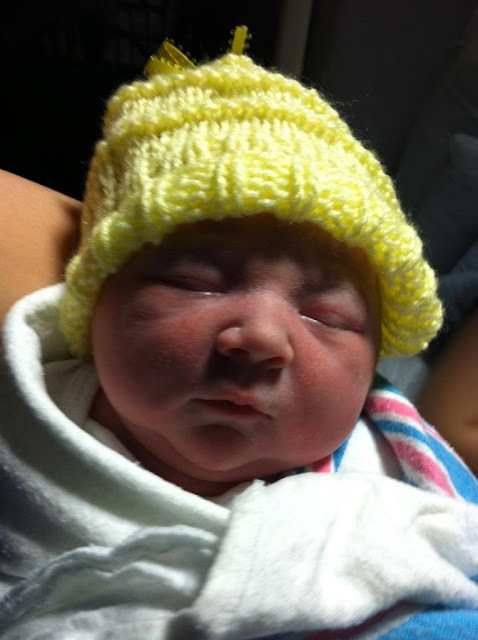 Lillian "Lilly" Grace Baum was born on January 24, 2012 at 7:35 pm. She weighed 7 lbs 6 oz and measured 19 3/4 inches long. Sorry for the lack of updates yesterday...it was a crazy day! Labor felt like it took forever when really it was only 12 hours - we were really very lucky because the doctor predicted an arrival around midnight due to how slow progress was pretty early on. I promise to blog about the birth story later on when I am not on my iPhone because typing on this thing is the worst! Grandmommy and PawPaw Eaker took baby girl's hat home and said that Layla sniffed and licked on it for several minutes and seemed very interested. I can't wait for them to meet. They will be the best of friends, I hope! It is 5 am and I know I should be resting but the excitement of the day (an the residual pain in my lady parts - sorry, boys) is keeping me up. We are terrible parents I guess because we sent Lilly to the nursery for a little while so that we could try to rest, but I can't sleep because I'm excited for them to bring her back in an hour so I can love on her some more. We love this little girl so much already - more than I ever thought possible and much more than I could even begin to know how to put into words. She is perfect, and I can't wait for her to meet all of you who love and care about her so much and have been sending prayers and happy thoughts our way.